You can use Contact Form 7 with WordPress and automatically create new leads in Táve thanks to the Táve Contact Form 7 Integration plugin. 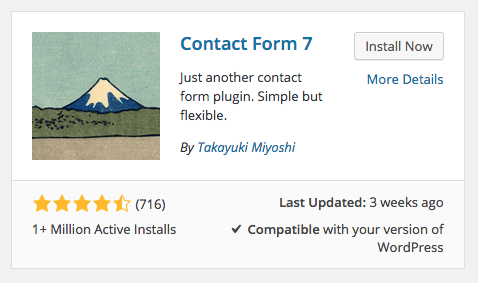 To start you’ll need to install Contact Form 7, a free plugin built for WordPress. From the plugins menu in WordPress, select ‘Add New’ and then use the search box to find ‘Contact Form 7’. Once installed, make sure that it is activated. You can install it by using the ‘Add New’ search in the plugins menu in WordPress, or you can find it in WordPress’s plugin directory. Once installed, make sure it is activated. Next, you will go to the Contact menu and then ‘Táve Settings’ where you will add your ‘Táve Secret Key’ and ‘Táve Studio ID’. You can get these numbers from inside of Táve by going to Settings › New Lead API. Once you’ve entered the key and studio ID, save your changes. Next, we’ll create our contact form by using the ‘Add New’ option from the Contact menu. There will be defaults set up for you automatically that we will need to change so that it works with Táve. In the ‘Form’ tab when creating a new form, you will replace the default code by copying and pasting the code to the left. You can change the JobTypes, JobRoles, and Sources to match your setup. Quick Tip: Adding an * next to the field type makes the field required. In order for Táve to create a lead from this form, you MUST have the ‘JobType’ field AND the options that you put in the dropdown must match ExACtlY what you have set up in Settings › Job Types. When entering your Lead Sources, in the case you have sources that are sub-types of another parent Lead Source, you'll just enter the sub-type in quotes in your form. For example, if you have a source that's Referral › Photographer in your Táve Settings, you'll just enter "Photographer" in Contact Form 7 and that will map to that Lead Source. In the form tab, you’ll need to make sure your email address is in the ‘To:’ field. Next, you’ll update the ‘From:’, ‘Subject:’, and ‘Message Body:’ fields to include the mail-tags like the setup you see to the above. Feel free to copy and paste from this code. Of course, you can change this how you’d like, especially the subject field. The last step will be to copy and paste the contact form’s short code into your contact page’s ‘Text’ tab. Save the page and your new contact form will be in place. Be sure to test it to verify that it’s creating leads in Táve. If you are looking to request additional information from your new leads that aren't built-in available fields, you'll need to use Custom Fields. You can create your custom fields in Settings › Custom Fields within your Táve account, and then add them to your Contact Form 7 form setup like in the example below, by using the appropriate field type and CF number assigned to that field. You can find the assigned CF number in your Táve account in Settings › New Lead API. If your contact form is for a specific job type, job role, or brand only, you can use a hidden field to set them instead of giving your client a dropdown to select from. 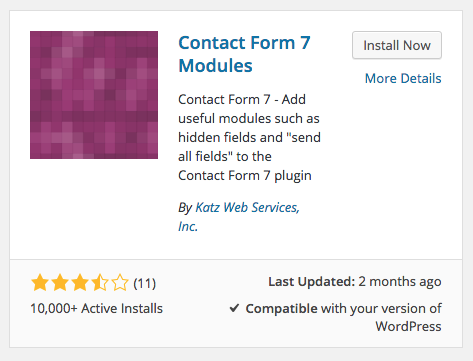 You will need to start by installing an additional plugin called ‘Contact Form 7 Modules’. This will allow you to add hidden fields to your forms. Once installed, make sure that it is activated. instead of the original drop down select option. This means that whenever this specific contact form is submitted, it automatically creates a new ‘Wedding’ lead in Táve. This is beneficial if you have different contact forms on different parts of your website. This means that whenever this specific contact form is submitted, the contact will automatically be marked as the ‘Bride’ in Táve. If you’re using multiple brands in Táve, this is helpful to have your contact form create a new lead for a specific brand. Passing this to Táve sets the new lead’s brand to “Topher Simon photography”. To find your brand ID or Name go to Settings › Branding.